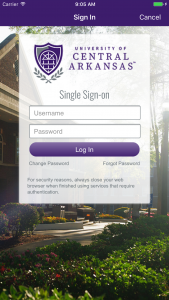 On campus or off, everything you need to know about the University of Central Arkansas is now at your fingertips. 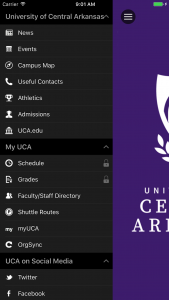 The latest version of the UCA app includes up-to-the-minute news, directions around campus, useful contacts and a calendar of events to keep you in the know. News – Stay updated with the latest campus happenings. Events – Learn about campus events. 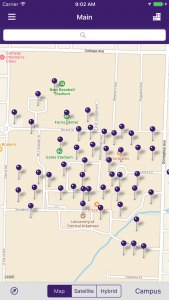 Campus Map – Use GPS to find your way around campus. The map also provides the ability to search buildings by name. Contacts – You now have a direct link to the most frequently used university numbers. Sports – Get the latest news and scores from your UCA Bears! Faculty/Staff Directory – Quickly search for and connect with UCA faculty and staff.